Seniors in the Verona area are learning how to prepare nutritional, affordable meals—and how good nutrition can help improve their health—thanks to a new community medicine project led by the UW Department of Family Medicine and Community Health’s (DFMCH) Melissa Stiles, MD, and Brian Arndt, MD. Each month, they hold the Prairie Kitchen Cooking Club, a two-hour class for people aged 55 and over that offers nutrition education, hands-on food preparation and lots of fun. Drs. Stiles and Arndt created the Prairie Kitchen Cooking Club in partnership with the Verona Senior Center and the Badger Prairie Needs Network (BPNN), which makes its commercial kitchen available for the class. Each session accommodates up to 12 people; seniors from anywhere in Dane County can sign up. After an introductory nutrition presentation by Dr. Stiles, Dr. Arndt and Hy-Vee dietician Kara Hoerr, participants prepare a meal together using recipes that work in smaller portions and that use ingredients available at BPNN’s food pantry. The $5 registration fee covers all instruction and food—and participants can take home what they prepare. Dr. Stiles said that each session has been well attended, and feedback has been very positive. “Some of the participants have never cooked before, so for them this is particularly educational as well as fun,” she noted. DFMCH resident Jared Dubey, DO, (on right) also helps lead the Prairie Kitchen Cooking Club. The Prairie Kitchen Cooking Club is one facet of a new DFMCH initiative, Clinicians in the Kitchen, that aims to raise awareness among primary care clinicians, learners and patients of the role food plays in health. In addition to Drs. 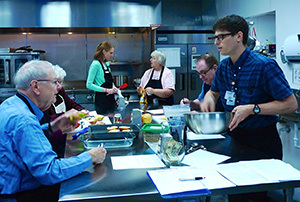 Stiles and Arndt, the group includes 10 DFMCH faculty, fellows and residents, and Julie Andrews, a registered dietician and coordinator of the Learning Kitchen at UW Health at the American Center. Currently, they are developing Food as Medicine, a series of public classes on how to cook carb-smart, heart-healthy and gluten-free meals, and identifying ways to include culinary medicine experiences in medical student education.